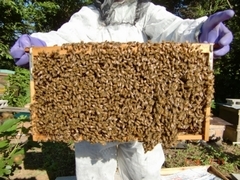 Prof. Toshiro Yamada of the School of Natural System, College of Science and Engineering, Kanazawa University, presented a study on September 2, 2012, that drew a close connection between neonicotinoid pesticides and the mass fatality of honeybees, called colony collapse disorder (CCD). While many countries in Europe and America have already banned the use of neonicotinoids based on circumstantial evidence, Japan has yet to ban them due to a lack of an established scientific basis. In their research, Dr. Yamada and his colleagues sought to find out if the two neonicotinoids widely used in Japan, which are mainly sprayed on rice fields to exterminate stinkbugs, are a causal factor of CCD. 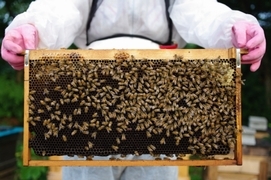 They conducted three field experiments between July 2010 and August 2012 using about 10,000 adult bees in 10 hives in an apiary. The study results suggest the following mechanism as a cause of CCD: foraging bees are killed instantly wherever pesticide is sprayed. The instant death of numerous foraging bees brings about a change in roles from house bees to foraging bees. The resulting lack of house bees and thus imbalance in colony composition (eggs, larvae, house bees, and foraging bees) causes a decrease in the queen's egg-laying activity, finally leading to the collapse of the colony. Even if foraging bees escape from instant death due to a low concentration of pesticide, the surviving foraging bees return to the hive with nectar and pollen contaminated with pesticide, causing colony members in the hive, including the queen, to ingest and accumulate the pesticide in their bodies. In the end, such chronic toxicity triggers CCD, the study indicates.